In this 2nd installment in our 3-part series on softscapes, Archadeck of Columbus discusses site conditioning for your softscape design plan. 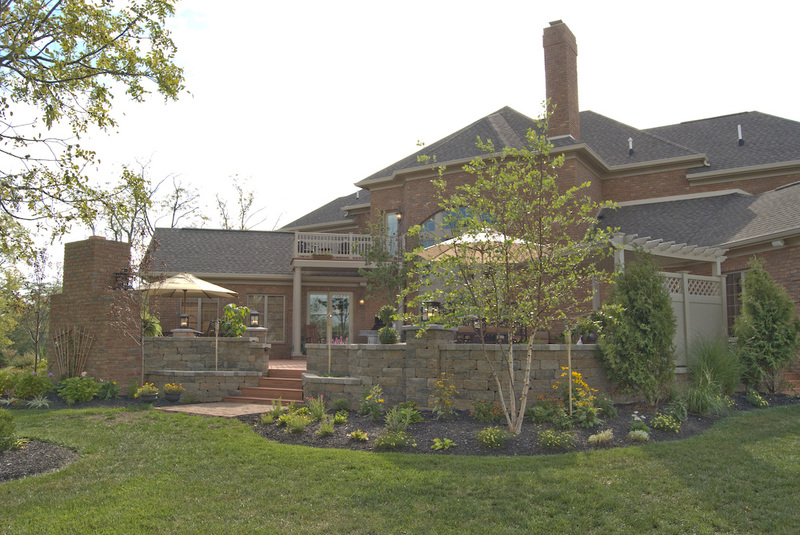 Lovely hardscape and softscape addition in Columbus, OH. In this 2nd installment in our 3-part series on softscapes, Archadeck of Columbus discusses site conditions for your softscape design plan. There is an art and a science to installing a successful softscape design. This is driven by a host of factors which include a vast knowledge of the way plant material reacts within a border or bed, the growth characteristics of the plant, and the type of conditions best suited for an individual plant. Many less than professional contractors will just “throw” a plant in the ground not looking beyond the moment of installation. These practices forgo any site considerations to give the plant(s) their best start in order to thrive. Archadeck of Columbus does not approach softscape design this way. 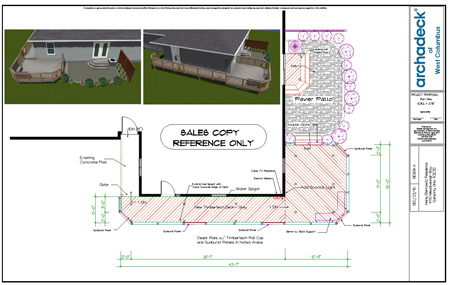 We create a master plan with each of our clients that provides a detailed image and specifications of your softscaping plan. Our design team always takes into consideration what colors the homeowner prefers, or if you dislike a particular color when planning your softscape. 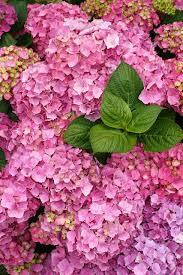 Hydrangeas work well in Northern facing beds and borders, and come in many colors. 1) Sun/shade orientation – When examining your individual site conditions, we first consider the orientation of your house and where the plantings will be located. For example, if the orientation of your site in on the North side of your home, it will receive a large amount of shade. For this site configuration we would choose shade loving plants to fill your border or bed, such as Euonymus, hydrangea and hostas, just to name a few. The same rules apply (but in reverse) when planning for a softscape that will receive a great deal of sun. For a sunny border we would choose sun-loving plants that are more drought tolerant than those required for shade plants. The soil within a sunny border or bed will dry out quicker because of sun exposure and evaporation, whereas a shady border will retain moisture and vital nutrients in the soil longer. This is also important to keep in mind when considering maintenance requirements of your softscape. Here are some other sun/shade conditions. Deep Shade—No direct sunlight – In very deep shade, it is often beneficial to include hardscaping, structures, water features, containers, and or sculpture for enhancement. 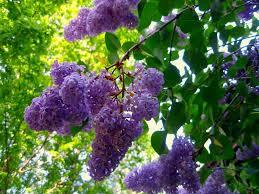 Lilac bushes are a great choice for Ohio landscapes because they thrive in alkaline soil. 2) Soil conditions – Much of Ohio lies on a limestone bed. This makes most of our soil here in the Columbus region very alkaline. The area that encompasses central Ohio works well with plant selections that are suitable for alkaline environments. A few specimens that perform well in alkaline soils include Lilac bushes and lilies, but the list goes on and on. 3) Outside interference – Any time we examine site conditions, we always factor in the amount of wildlife that may visit your property. The urban deer population has become a really big issue her in our area, and can decimate an entire border in one visit! 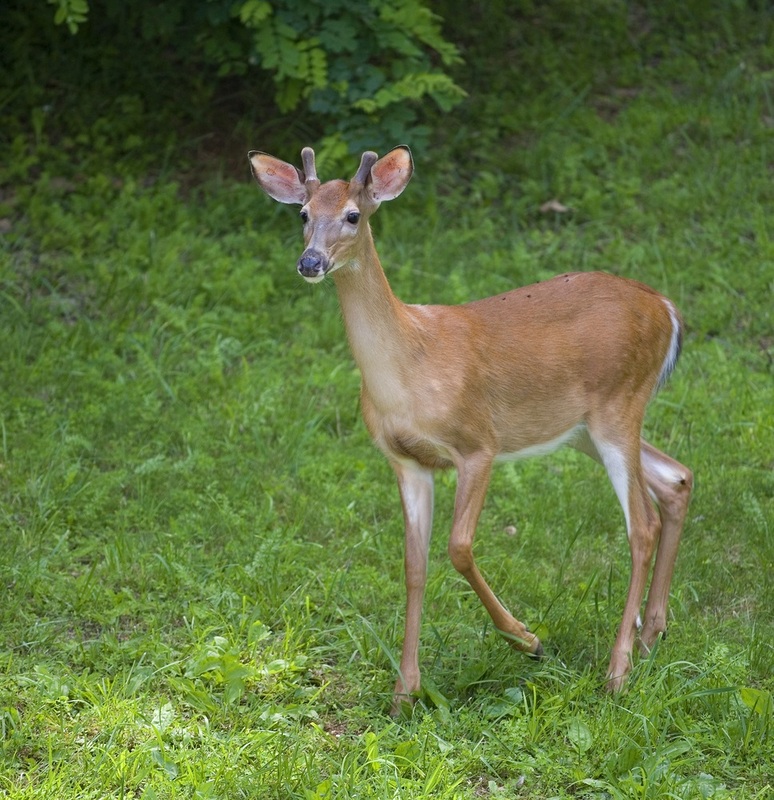 We take all these factors into consideration when planning your softscape by adding deer deterring specimens to your design. We also consider the welcomed 4-legged friends that visit your site. We make sure your pet has a direct path that leads from the door to the area they use most often. We will do the same for the 2-legged friends that will be frequenting your proposed area around your softscape, perhaps we will even add stepping-stones through your border or bed for easier access to their favorite backyard retreat! Do deer like to visit your backyard? We know which plants will deter deer when added to your softscape. 4) The highs and lows – Grade is an important consideration when preparing your site for a softscape installation. Archadeck of Columbus can use the grade of your site to gain the most benefit. We can create beds on a flatter surface and use hardscapes, such as retaining walls, to solve grade issues at your site. We also readily use spreading, ground covers on sloped areas for erosion control. 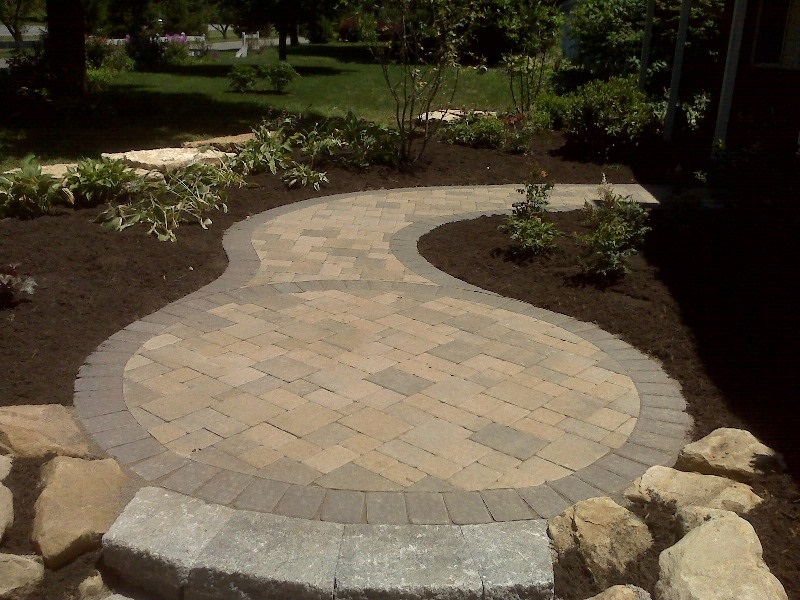 Hardscape paths integrated into a border or bed will alleviate plant damage by foot traffic, and they look beautiful! We instill the expertise and knowledge of a great nursery in Norton OH, called Dayton Nursery and Garden Center. They have a plethora of helpful information on their website. Their easy to use directory allows you to look up information many different ways and even add commentary. This valuable resource is even targeted to the central Ohio region specifically. Another great resource we utilize is a computer program called “Horticopia“. It has everything you need to know about every plant imaginable, including pictures and specifications! Archadeck of Columbus explores the world of color choices in hardscapes. What is popular and tried and true here in the midwest, and how to put together the right color palette for you. 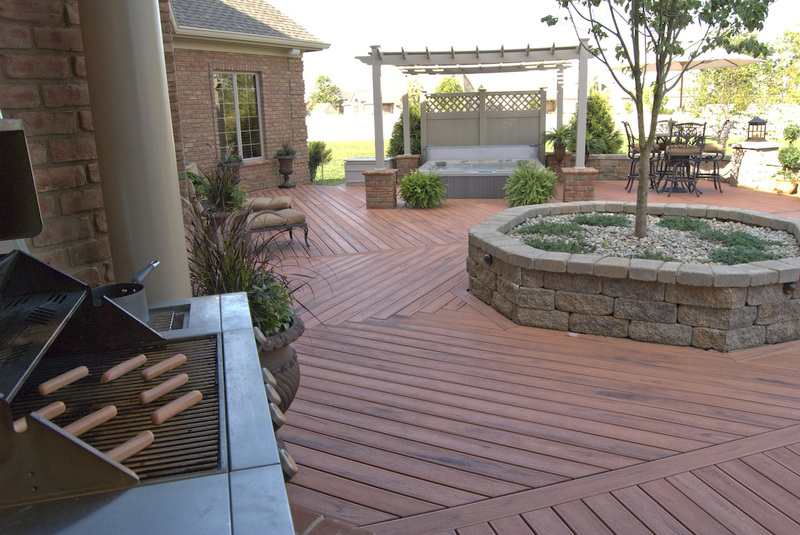 Archadeck of Columbus prides itself in keeping up with the new design trends when it comes to hardscapes and other aspects of outdoor living design. 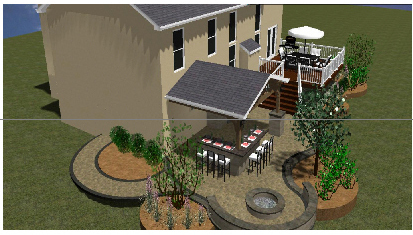 Recently, I was fortunate enough to speak with Guy Lane, who is the design consultant for Outdoor Living by Mr. Mulch. He was able to let me into the world of colors with his artful eye on design and expertise. Speaking with Mr. Lane gave me the insight on what direction consumers are going in terms of color palettes for hardscapes. Naturally, the popularity of certain colors depends mainly on your demographics. Here in the Midwest the popular hues consist of neutral browns and taupe based beige. These neutral tones are most often accentuated by charcoal gray, and very dark gray tones used for banding and accents. 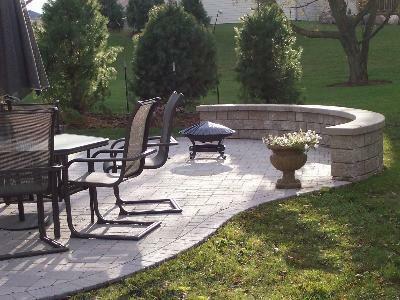 When a customer is installing a patio, or other hardscape structure you mainly want to stick to a basic, classic, tried and true color palette because you want the landscaping and flowers to be your focal point. Too much color going on in one area will make your focus uneasy, and will make it difficult for your eyes to be at rest. You can use complimentary colors to make your basic color scheme “pop” through the use of outdoor accent furniture and accessories. The outdoor living industry has grown in leaps and bounds and there are designs, patterns, textures and colors available to suit every taste. Sometimes when you think hardscapes the first image that pops into your mind is that of a terra-cotta paver. The terra-cotta palette of hardscapes is not used that often anymore. Brick red, and richer red accents however, are commonplace and used in accents, borders and banding. Even though the light gray family of colors, with its more commercial and contemporary feel is not a very popular color choice on its own, when paired with the brick-red, it becomes stunning. Another design trend we are seeing is the use of chocolate browns to add spots of color to a design. That same chocolate can be seen throughout outdoor living accents and fabric industry as well, where it is often paired with spa blue for a relaxing and soothing effect. Generally, blues are not a popular hardscape color. Blues in hues from slate all the way to your darker blues are rarely seen used in hardscapes. The use of white and creams are used marginally here in the mid-west. We do see a certain amount of customers who do like them, Says Lane, but it is minimal. Even though this palette gives an essence of crispness and cleanliness, people are sometimes hesitant to use these hues simply because of the upkeep factor. They feel it is a harder color to keep clean. Color guidance is an important tool to have when deciding colors for you new outdoor structure. Whether you decide to use the ever popular and classic neutral brown and taupe based tones, or decide to think outside the box, choosing your color palette is a fun experience. Another key is to remember you can always change out you accessories to suit your taste much easier and at a minimal expense, when comparing the headache of changing out the colors in your hardscapes. That being said, using a classic neutral color choice can also allow you the freedom to experiment or even seasonally change your accents and just have fun with it. Your hardscapes can serve as your artist’s canvas, and then the rest is only limited to your imagination. 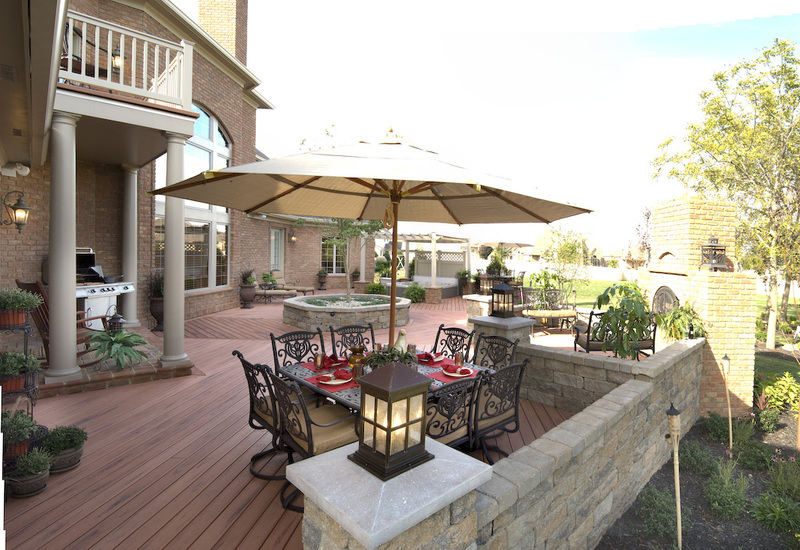 Archadeck of Columbus, OH explores the trends in pavers. 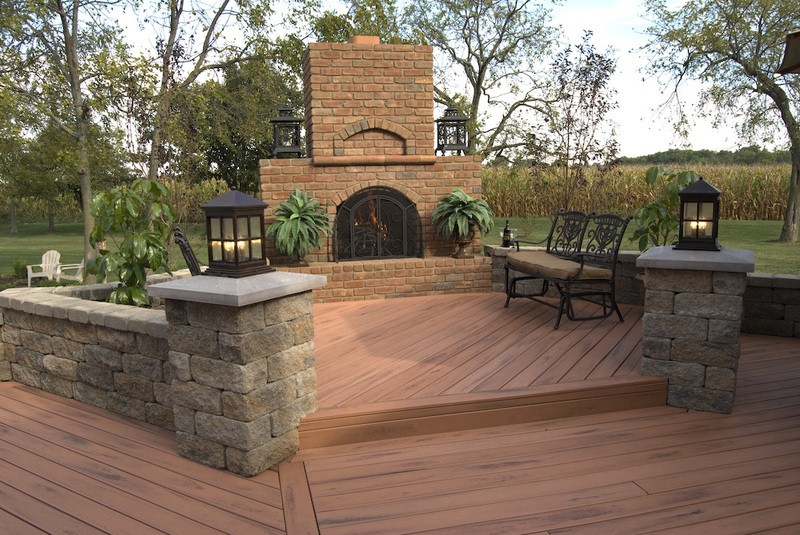 Pavers are used on a wide scale to construct floors, patios, retaining wall, pillars and outdoor fire pits and fireplaces. Everyday we are asked about hardscapes and pavers. 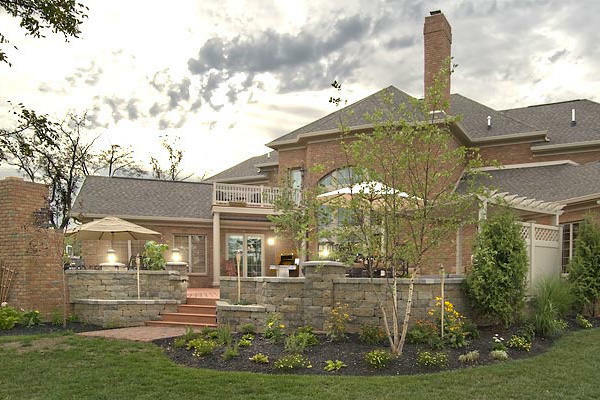 Hardscapes have become very popular recently. With the choices and styles sometimes it can be quite a chore just to make a selection for your upcoming project. One of the things we love to do as design consultants, is to aid in making your selections. I do want to take an opportunity to share some of my thoughts and experience on pavers and hardscapes with you, in essence a “who’s who” and “what’s best”. 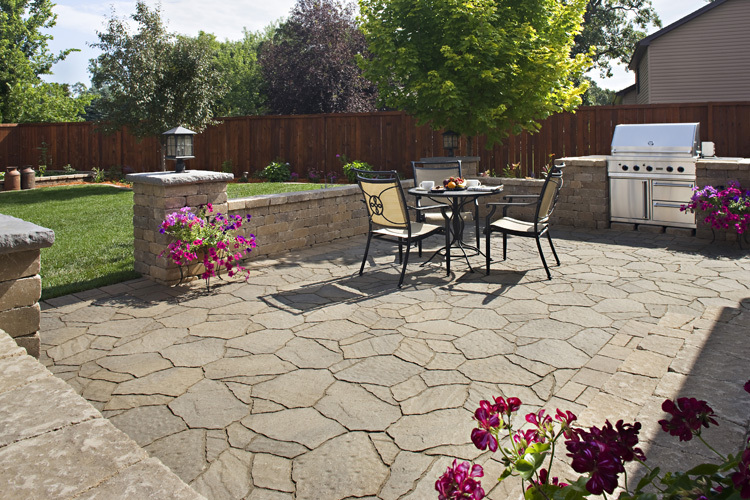 pavers come in either a smooth surface or a more rustic surface, which is referred to as “tumbled”. Stonehenge and Brussels are a good representation of the “tumbled” pavers. Various styling trends such as the lane pattern’s and Curvilinear are popular. Curvilinear is a little more expensive because there is more cutting involved. Styles such as these a larger and more like tiles or slabs that mimic the look of natural stone. 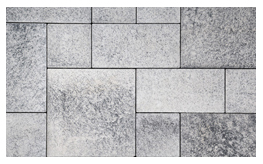 Belgard also has a line of natural “stone”- like pavers as well. Of course when considering building with pavers, foundation, as is the case with any construction, is very important. 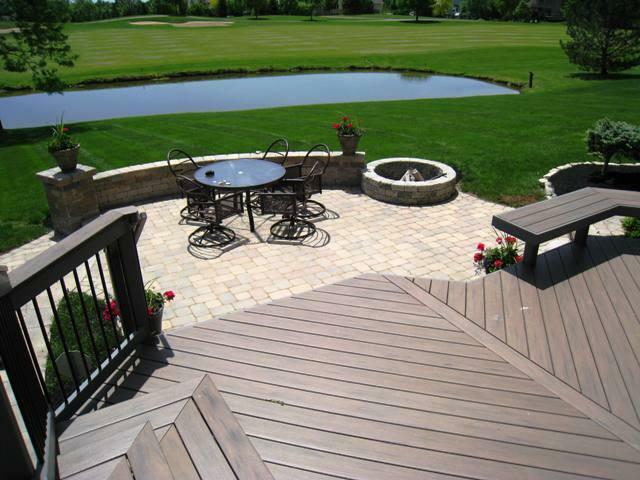 The advantage of using a concrete paver over a concrete pad or stamped concrete. With a paver you don’t run the risk of a cracking foundation because when using pavers you have a joint that acts as an expansion joint, and if potentially something goes wrong it is an easy fix. 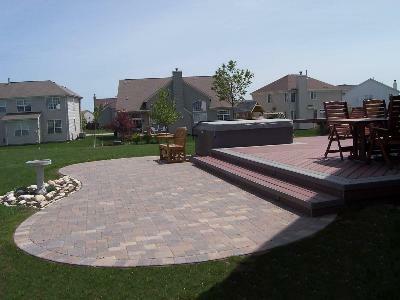 In the Midwest the most popular pavers are Oberfields and Unilock. Both are good concrete pavers, however over time Oberfields will lose some its color. An inexpensive color will start to show more of the aggregate within the paver much more quickly than a higher quality paver will. The aggregate color which usually comes forth is a concrete-type grayish tint and this is the reason we generally don’t recommend using Oberfields. Another important aspect when considering pavers is water drainage and elevation.You always want to keep the water away from your house. We add a slight slope with installation of each paver to ensure that the water is flowing away from your home. When elevation is an issue, for example if you have a slope in your backyard, there will be a necessity to create a retaining wall(s). In this case we usually suggest a fall of 6″ or more. 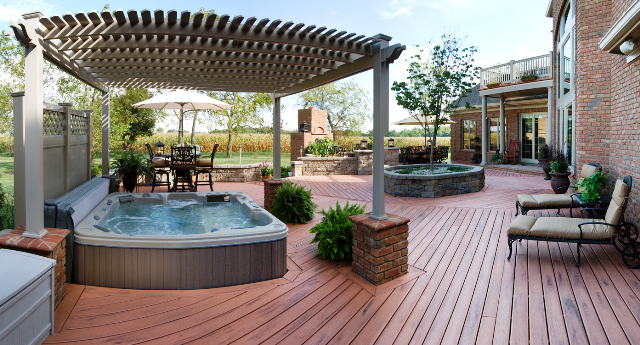 Another choice for keeping water away from the house is Belgard and Unilock’s permeable pavers. They are the new “green” thing in pavers. They are slightly wider and water goes through them, however they do require a different type of installation. A great facility to view pavers here in Columbus, OH is Mr. Mulch. They are a retailer with about 25,000 feet of display area which includes Techno-bloc and Unilock pavers. Another place is Wellnitz. My grandfather was Harry Wellnitz and he actually started the company, they now specialize in landscaping and carry Belgard products as well. 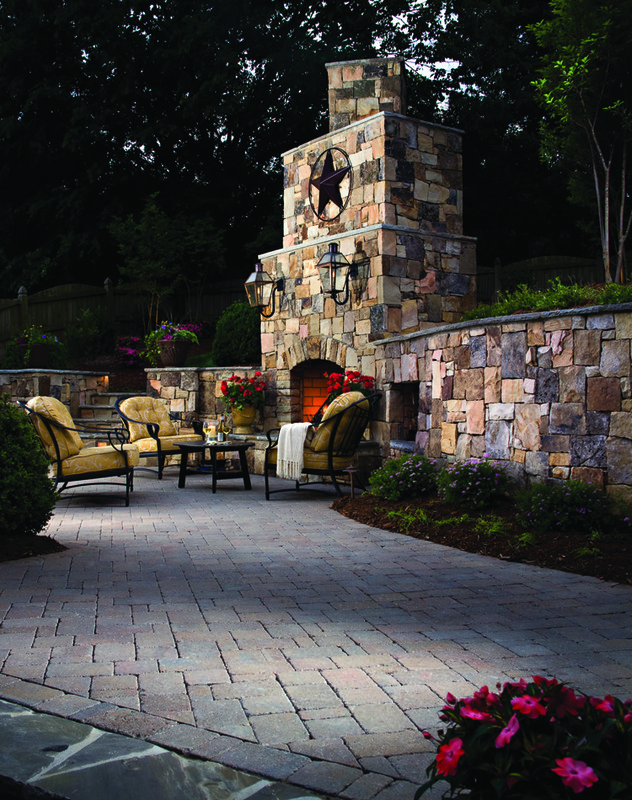 Belgard is a high-end product that is not only used for paver floors but also seating walls, pillars and the ever popular fire pits and outdoor fireplaces. Last but certainly not least are Techno-bloc pavers. Believe it or not this is the only paver that will withstand salt being applied to it. This paver will come in handy to use if you live in area that requires a great deal of de-icing each year. 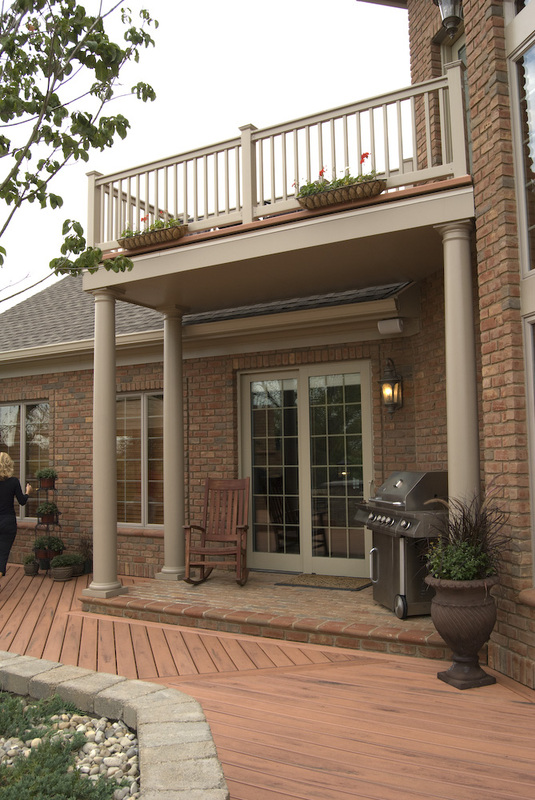 Archadeck of Columbus pairs together a deck and patio combination that suits these Columbus, Ohio homeowners to a “T”. 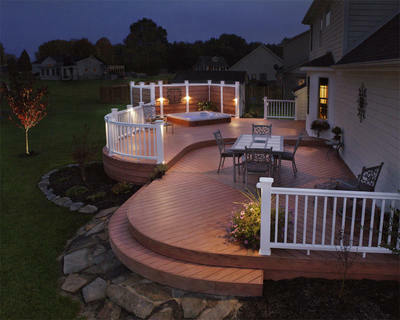 Here at Archadeck of Columbus, we recently completed a deck for this homeowner in Gahanna which is located in Columbus, Ohio. 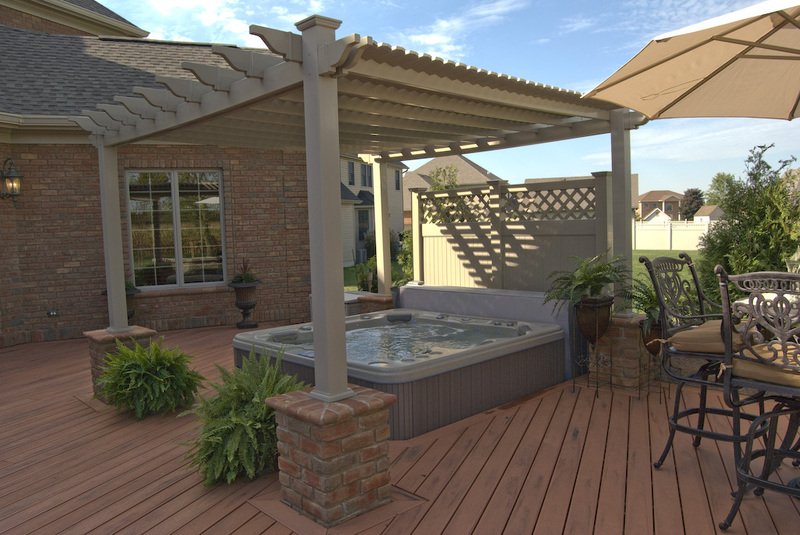 This customer decided to install a deck and patio combination because they liked the idea of having two different living areas and having adjoining seating areas to enjoy throughout the season. Patios can be installed in the Columbus area from about March 15th until the first freeze which is usually around mid-December. 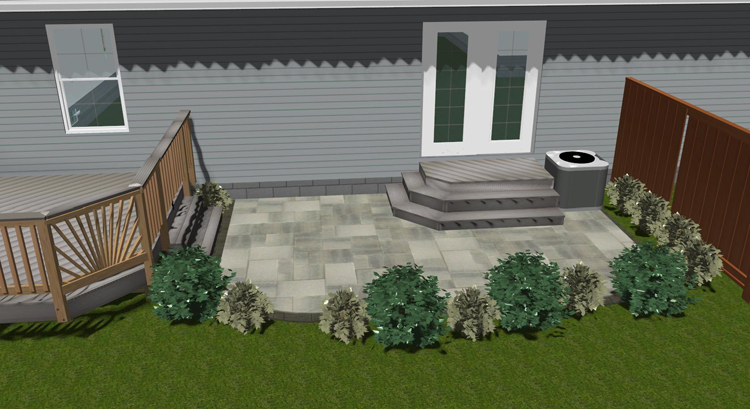 The ideal is to wait to begin a patio until March or early April to make sure the ground is not frozen, or in some cases muddy from melting snow or ice. We constructed the deck using TimberTech XLM in beautiful “river rock” gray and used a cedar rail for a wonderful contrast. We completed the deck prior to the stairs because we wanted to make sure the stairs are all the same height. 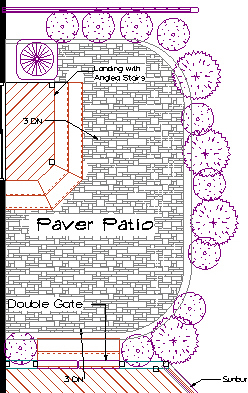 The upcoming patio will be oval on one corner and the other corner will be a straight rectangle to accommodate a small retaining wall. Due to the excavation that is necessary for the patio’s installation there will be excess soil that needs to be removed. 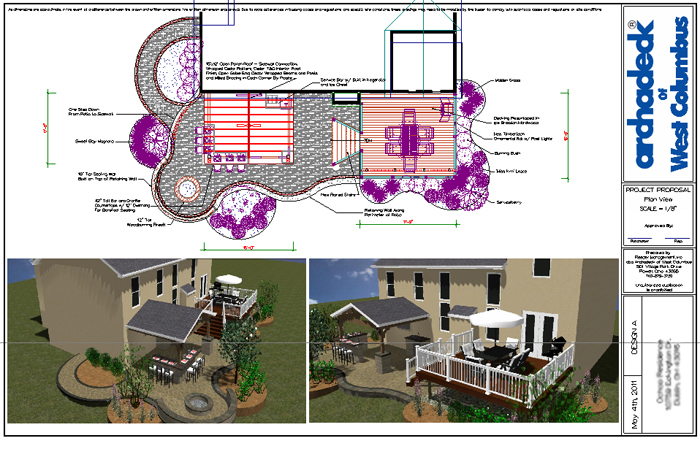 In most cases we can use excavated soil as topsoil to create planting beds or an upgrade at a later date around the perimeter of a structure such as this patio. In the case of this customer, they wanted to add planting beds that they could go ahead and plant in now. This worked out perfectly for this customer. We will also be adding a spading edge to the planting beds and mulch. The patio itself will be finished using Uni-lock Umbriano pavers. These are concrete pavers but are made to look contemporary, the end effect resembles slabs with a larger pattern. 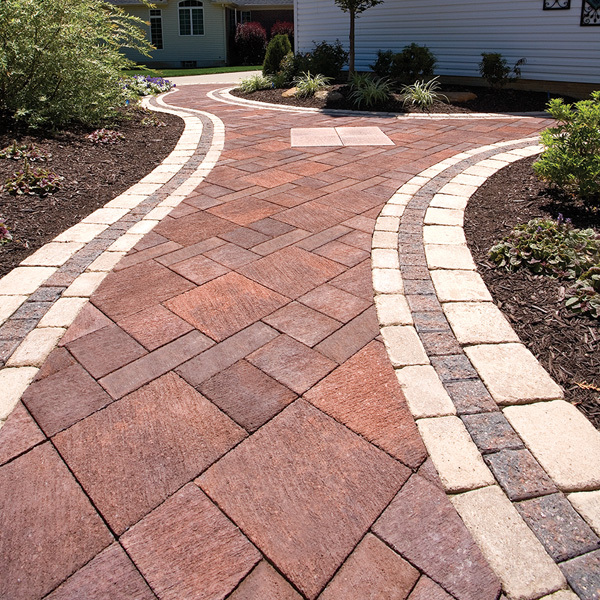 This type of paver has been quite popular in the Columbus area. The color these homeowners chose is “winter marvel” for the field area and the soldier course ( perimeter/border) is “midnight sky”. We anticipate this combination will be breathtaking when completed. 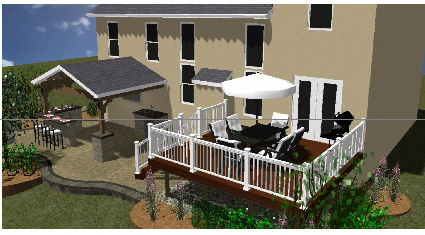 The choice to include a patio with the deck area is clearly a design that can be integrated into any landscape whether it is single or multi-level. Having multiple living areas is a growing trend. The two structures harmonize together beautifully. or email us at westcolumbus@archadeck.net.